Inmesol’s Administrative, Manufacturing and Production Centre is located in Corvera, 20Km from Murcia, in southeast Spain. Inmesol company is an important manufacturer of generator sets in a period of industrial maturity; it is present in a large number of markets and continues to multiply its production capacity. Its staff has a high degree of specialisation, giving it the capacity to anticipate special market demands and provide a professional response to meet them. At this time, Inmesol is present across 4 continents with equipment installed in a wide variety of industries, residential areas, sports complexes, public works, hospitals and hotels, among others. Inmesol’s history can be summarised as a continuous process of improvement in human, technological, manufacturing and commercial aspects, enabling it to lay solid foundations from which to continue its growth in line with its objectives. 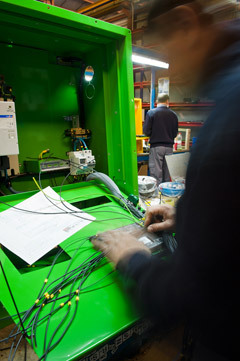 Inmesol’s mission is to manufacture gen sets for highly competitive markets, as it has developed important solutions for its equipment in industrial design and metal protection treatments for frame and bodywork elements, reducing their heat, gas and noise emissions to meet its standards, as well as the design, composition and operability of its control panels. As a result, its products are continually optimised as regards both operation and consumption. Inmesol operates from Corvera, just 20Km from Murcia, very close to air, sea and land logistics centres, which helps to suitably plan the delivery of orders. Given that its work philosophy includes continuing training for the specialisation of it staff, together with the systematic increase in robotics support for the automation of the manufacturing processes, it continuously extends its capacity of service, making it increasingly more productive. In all the markets in which Inmesol is present it shows enormous adaptability to any new needs from current and potential local customers. This way, Inmesol has achieved a configuration in each of the applications, and all of its ranges, based on the highest of quality, usability and operability standards. It is also expanding in the area of equipment configured for specific projects. As well as the inclusion of the desired technical details, it gives great importance to the durability of its equipment. Inmesol has accumulated decades of research for the improvement of its gen sets with the aim of satisfying the most demanding customers in international markets. Its multidisciplinary team of highly qualified engineers make a continuous contribution to improving the components of its gen sets, from industrial design and component structure to the treatment of the materials and productive processes, in order to optimise the operation, facilitate refrigeration and increase the level of soundproofing. As a result of this, the engines can work under ideal conditions as these improvements facilitate combustion, reduce gas, heat and noise emissions, and prolong the working life of the gen sets. As regards the control panels manufactured by Inmesol, the choice of optimum components for each configuration and the quality control which the automatic panels for their gen sets in island mode and networked parallels undergo, help to continuously increase their performance. Inmesol has levels of productivity that allow it to produce a manufacturing volume that will continue to make it competitive in coming years. Even so, its plans to increase its manufacturing capacity are very ambitious. Inmesol maintains its presence in over 50 countries on 4 continents with a planned and constant rate of growth which will position it in many more markets in the coming months. This is thanks to a highly specialised commercial team, the sales management tools it constantly incorporates and its manufacturing capacity, which could double its current production when necessary. Inmesol is a company that is ready to maintain a constant rate of growth. Inmesol’s administrative and commercial offices are located in a physical area of 30,000 m2. As well as its industrial premises divided into very well conditioned areas of robotised productive processes. Some of its mass production lines are doubled, or even tripled, in order to prevent the manufacturing process from slowing down. Sheet punching and folding. The entire process is robotised. Welding. The entire process is robotised. 3 robotised painting lines which allow great production capacity. Generator set manufacturing area, on continuous production lines. Once the manufacturing of each of the gen sets is complete, they must go through the quality control process. Inmesol subjects each of its devices to a wide variety of checks and tests on its test benches, which allows it to guarantee that the quality standards of the most demanding markets are met.